Fiberglass Ram Air Series Hood 07-09 Jeep Wrangler Fiberglass Ram Air Series Hood 07-09 JEEP WRANGLER, Fiberglass Ram Air Hood 07-09 JEEP WRANGLER, Ram Air Hood 07-09 JEEP WRANGLER, Fiberglass Custom Hood 07-09 JEEP WRANGLER, Custom Hood 07-09 JEEP WRANGLER, Custom Ram Air Hood 07-09 JEEP WRANGLER, Hood, [US Body TCJH-07MR Hood Jeep] - $799.95 : 3rd Strike Performance, Your Source for Late Model MOPAR Performance Parts and Accessories! Composite-Tech Hoods made in Florida. 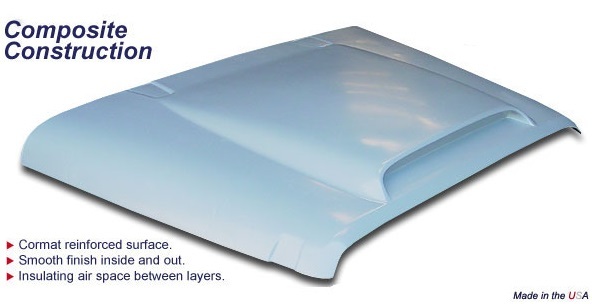 Whether you are looking to draw more air into your engine, in need of clearance, or yearning for a cool new look, this fully lined Composite Tech-Hood is just what you have been looking for. The high quality inner liner fully supports the outer skin, providing a show worthy inner structure which is smooth, strong and ready for prep and paint. The surface is Cormat reinforced, insuring it is both strong and straight. A smooth sandable type gelcoat is used for the finish so its a snap to prep for paint. Steel anchors allow for use with your stock hinges and latch mechanism. A lighter weight version of this same hood can be custom made for all types of racing applications. Easily installs to factory hinges. Remember parts must be pre fitted before painting. Bolts Directly to the OEM hinge & Latch. Note: Sanded, primed or altered parts are non-returnable. All hoods ship truck freight. Hoods can only be shipped to a business address or freight terminal. Period. Not deliverable to a residential address. Freight charges are non-refundable.